Shifting Gears: Commuting Aboard The L.A. Bike Trains One of the largest obstacles in getting people to bike to work is their fear of getting hit by a car. A new grass-roots project in Los Angeles is helping folks navigate the ins and outs of traffic with community-based riding. One of the largest obstacles in getting people to bike to work is their fear of getting hit by a car. A new grass-roots project in Los Angeles is helping folks navigate the ins and outs of traffic. "It was kind of daunting," she says, "because seven miles to the lab — I didn't know how to do it. I'm not an avid cyclist." 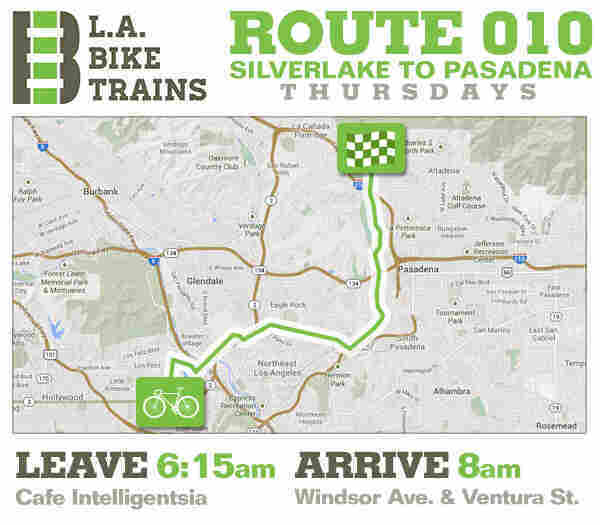 Enter L.A. Bike Trains — an organization that arranges commutes by bike in groups. Each Bike Train route has an experienced conductor who serves as a guide. Insua especially likes that these volunteer conductors offer new riders door-to-door service from their homes to the train. "He came and picked me up from my house," Insua says. "[He] went out of his way to get me to bike for two or three weeks. Then I was conditioned. Then I was brainwashed." Charles Dandino is the conductor for Insua's bike train today. On this particular ride, the group is five people — the most popular routes see about 10. Dandino gives the safety rundown and explains cycling hand signals before they set off. This commuting concept came to longtime cyclist Nona Varnado when she moved to L.A. from New York. She found that riding here was completely different. "I realized I needed a one-to-one personal education on how to ride around the city," Varnado says. "I needed to be shown this street. This is how you cross an intersection." Varnado figured others could use the same kind of help. Since launching L.A. Bike Trains in May with just a few routes and no budget, the system has grown to a dozen volunteer leaders, covering Los Angeles by bike by as much as 20 miles per trip each way, like the route from Silver Lake to Santa Monica. Still, bike trains are far from seeing mass adoption. Herbie Huff, a policy researcher at UCLA, says there are lots of obstacles to taking part in bike trains. Instead, Huff thinks infrastructure like bike lanes would be a bigger winner, or a concept like bike sharing could be an easier entry point. "In order to go on the bike train, you need to already have made a commitment," Huff says. "You need to already have a bike." And then there's the issue of safety. In fact, on Insua's ride, a car cut through the single file of bicycles, missing one person by just a couple feet. 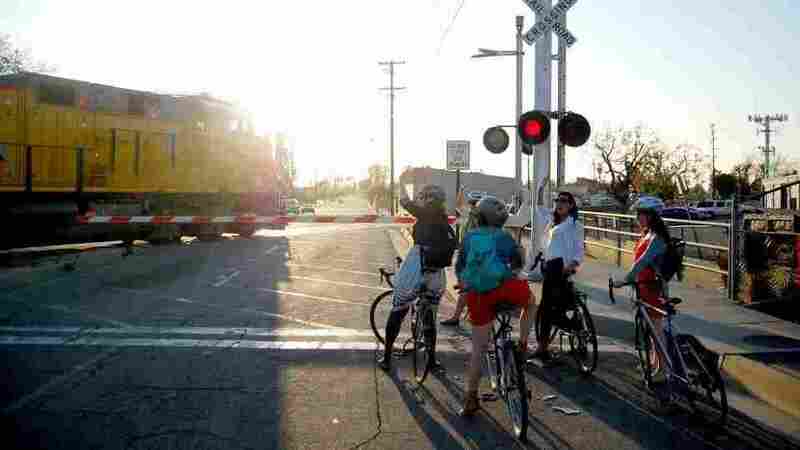 So perhaps the greatest obstacle to bike trains is that drivers don't like sharing the road. "It's like they enjoy taking up the lanes," says Jackie Burke, who has lived in Los Angeles her whole life. She says bicyclists drive her crazy when she's in a car and has to slow down for them. "It's very frustrating, to the point where I just want to run them off the road," Burke says. "I've actually done one of those drive-really-close-to-them kind of things to kind of scare them, to try to intimidate them to get out of my way." With road conditions like those, it's no wonder Conductor Dandino plays a mellow soundtrack, piped through a small speaker during the ride. Bike trains move at the pace of the slowest rider, so even though there have been some hills and an aggressive driver, all in all, Insua's commute is pretty pleasant. Insua arrives at her office about 50 minutes after she started out. The ride was hard, she says, "because I don't take that route very often. But we made it. We're here." And with that, one converted cyclist heads into work to start her day.